The article provides information on how Administrators can change user’s security settings and how Users can change these settings in their own accounts. Passwords and Security Questions on your Office@Hand Online account maintain your account’s confidentiality and privacy. On the log-in screen, click Forgot Password. 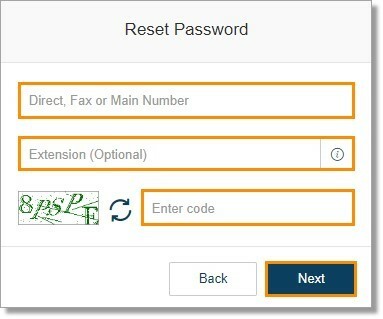 Enter your information and the code then click Next. Enter your answer to your Security Question then click Submit. An email will be sent to your account’s email. Follow the steps provided in the email.